When you contract Extreme Granite & Marble to supply, fabricate and install marble in your bathroom, you’ll experience a pleasant and seamless professional project that will have you coming back to us for other home remodeling projects. Visit our impressive marble showroom today! Extreme Granite & Marble, Inc. is the largest local fabricator and installer of marble countertops in Southeastern Michigan. We have a state-of-the-art facility with the latest tools and technology to fabricate your marble slabs to perfection. 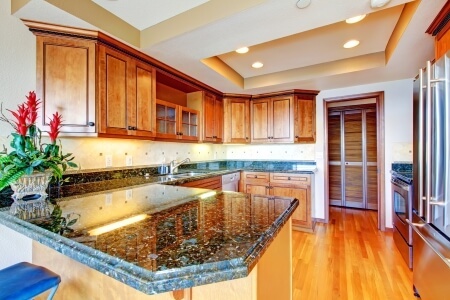 Your new granite or marble tops will be quickly installed by our professionals and handled with the utmost care. Your needs during the process will always be happily catered to. No matter the shape or dimensions, it will come out perfectly. In addition to offering superior products, customers will have the opportunity to take advantage of the personal services provided by our experienced and professional staff. You’ll be delighted about design professionals who can work their magic to help you choose the right marble to match your current interior décor. Additionally, the products and services offered by Extreme Granite & Marble will keep your bathroom beautiful and luxurious for decades. Marble is the most beautiful of stones and it is mined in various parts of the world. You’ll be proud to know that your countertops have come from countries like Italy, Brazil, Egypt, and India. 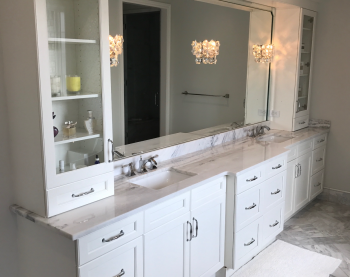 We are certain that we can transform your huge extra-long bathroom counter with the double sinks and that Jacuzzi tub surround or that tiny condo sized bathroom counter and backsplash with a standalone shower into a stunning place to retreat and relax after a long day. Your satisfaction is our guarantee and you’ll soon become a return customer. Whatever it is you need, we’ll deliver. Special requests are welcome, and you’ll enjoy a seamless process from start to finish. From simple vanity sinks to detailed mosaics, we do it all! 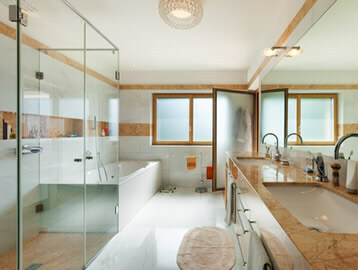 Our professionals will also enlighten you further about various marble stone product solutions. 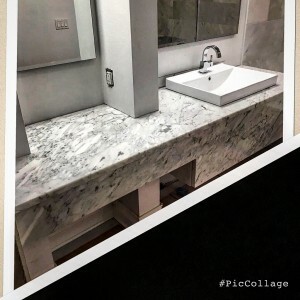 If it’s marble you desire and dream of for your bathroom countertops then its Extreme Granite & Marble you want to supply it, to fabricate it and to install it. We’ll take care of the hard work for you. You have the job of choosing the marble you want from the hundreds we have in our 2200 square foot showroom. Even more than it being an ancient and enduring stone and along with it instantly beautifying any room, marble adds value to your home or business, especially when it comes to you considering selling it. 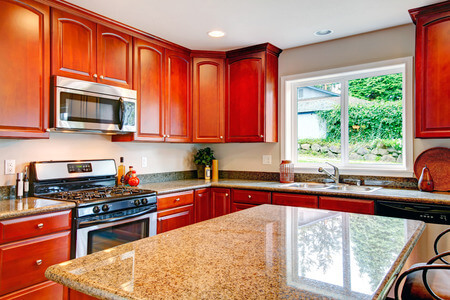 Extreme Granite & Marble has many satisfied customers, not only in Troy, but in other cities such as Clarkston and Rochester. We’ve been around for a while, and our reputation is sure. Homeowners and businesses have trusted us to transform their spaces into beautiful show places, and we have. Call us today and schedule a free in-home estimate to begin the process of allowing us to supply the marble countertop(s) of your dreams. We are sure that you’ll be completely satisfied with our products and services. 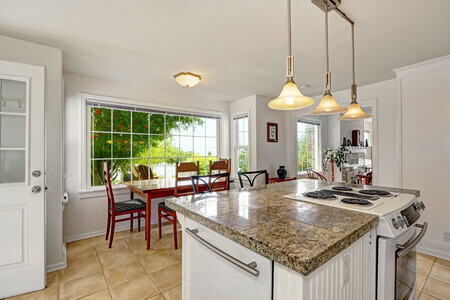 We make home remodeling simple and pleasurable― you make the choices and we do the work. 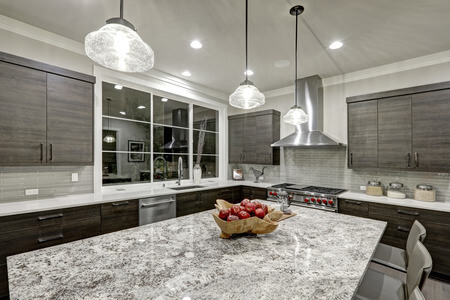 At Extreme Granite & Marble, we can do it all.